Katarzyna Gruda, the Director of AAS GD, is participating in the 1st Annual Juried Exhibition at DCCP space in Russell Industrial, Detroit. The show will continue to be on display until October 15, 2011. What makes a photograph distinctly contemporary? How do photographers respond to the contemporary world, and how is it different from past photographic art practice? These questions frequently came to mind when considering and selecting work for this exhibition the first juried exhibition at the Detroit Center for Contemporary Photography i(DCCP). In viewing such an amazing of range of work, submitted without any prescribed theme or definable territory, I found that subjects, styles and interpretations relevant to contemporary photographic practice are perhaps deliberately indefinable, without categorization and absolutely limitless. It was a wonderful and completely liberating realization for a juror who found as well that the most compelling submissions were those not bound to photographic traditions of the past, specifically those traditions informed by narrative structure or the medium of black-and-white photography. One consideration that tied many of the selections together, as diverse as they may be, was the mindful ability of selected artists to elevate and define our contemporary world, its general appearance, as well as its ordinary occurrences and scenery from everyday life into revelatory visual experiences through the medium, for the most part, of color digital photography. In a city with so few exclusive venues for the exhibition of photographic work, these selections offer a welcome and hopefully broad but not entirely definitive glimpse into the world of contemporary photographic image-making for individuals visiting the DCCP in the here and now. 13th Street, inkjet print, 18"x30"
13 Comments so far. Comments are closed. That picture is such art! Beautiful work…. You wouldn’t give away some of the behind the scenes secrets would you.. like apeture/shutter speed/ and Lens…. Its an amazing look… was any of it post processed? In this photo, one fully expects the actors to enter stage right and begin a dialogue. Please note the No Smoking sign. I was just in Detroit over the weekend for the Free Press Marathon & with a hectic schedule we couldn’t get to the exhibition. Thank you for sharing here! I love when an overlooked place or moment (especially one I apparently pass multiple times a week) is elevated like this. Congratulations Kasia! Stunning photo! It’s like a stage where one can insert their own story. Love this photo and have enjoyed spending time with it. For me it highlights the uncanny nature of NYC. Thanks Kasia! This is a typical Kasia photo, full of resonance as you are drawn into its story that lies somewhere deeper than its surface. It’s great to see it on display here! Congratulations Kasia! 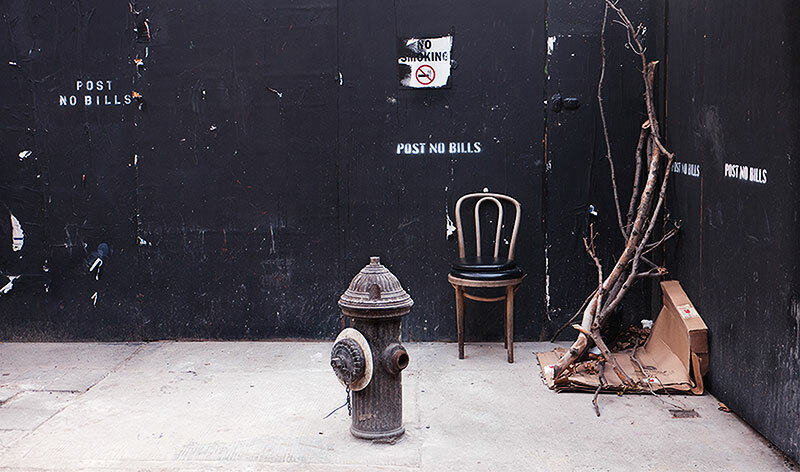 This photo is so lovely, you created a visual poetry with otherwise seemingly mundane objects. Yes, you do pass it every day. !3th and 5th. I like this photo. I know this location and you captured it. Congrats on this show. I like how this photo feels like a theater stage.